Last night the new Powderpak Parks (PPP) Carrum Downs facility was officially opened with an industry opening event. The night was a great success and the vibes were all time. Shredders were throwing down stunts all night as the crowd cheered on their performance. The night was also proudly supported by some businesses in the region. Mornington Peninsula Brewery donated some of their fine ale and Pier 10 Winery provided their Pinot Grigio and Pinot Noir for the evening. Grazen Cafe did the catering with some mouth watering street style food to suit the occasion. Red Bull also provided some energy drink that kept the shredders hyped all night. The whole evening was on point and the feedback on the park was outstanding. Massive props to Darren Teasdale from Sno Pics for the shots! 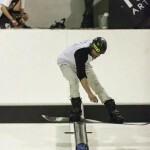 We are hyped to be introducing Australia’s first artificial snow surface indoor Terrain Park with permanent features for boarders & skiers to ride all year round. It provides riders the ability to be on their boards and skis’ every week practicing new tricks and perfecting their style. Powderpak is a soft artificial snow surface utilised by all Australian snow resorts. The surface is the closest thing to the real snow experience. The indoor slope features ramps, jumps and boxes that the riders can perform tricks, the same as if they were at a snow resort. It’s perfect for beginners and early learners for practicing and progressing for the real thing at the snow resorts. Beginners will gain a certain level of competency and will get better value from their lift tickets and equipment hire by the time they get to the resorts. Burton has specially designed learner snowboards available for hire at the PPP and professional tuition is available. It’s an inexpensive way to get started and to build your skills fast. Once you get to the snow all the learning has been done. And for experienced riders, there’s the opportunity to practice new tricks and perfect their style on a year round basis. 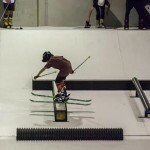 The Park is located in Carrum Downs Melbourne in a specially designed warehouse giving riders the best off mountain experience. We see the Powderpak Park as complementing existing offerings at the snow resorts where riders can practice their tricks before hitting the mountains. PPP will inspire continued interest in the resorts and provide an additional avenue for new riders to be introduced to the sport and the resorts. What a great way to spend your time, learning a new sport, staying fit and having fun. The park is now open every week Wednesday – Friday 6-9pm Saturday and Sunday 12-3pm & 3-6pm (3 hour sessions). Session cost $25 members, $35 non member’s $50 membership fee. Bookings are essential to ensure you get on the slope. Check the website powderpakoz.com for further information.